INCOK - Loving yourself begins lifelong romance! Why We Need These Pumice Stones? Looking for a solution for the rough skin? The INCOK Natural Earth Lava Pumice Stone helps to get rid of unwanted calluses, dead skin and rough dry skin on feet, hands, elbows, or knees. Gives you naturally smooth, soft skin with the healing power of exfoliation. INCOK Earth Lava Pumice Stone is purely natural and eco-friendly. Let's do little jods for environmental protection! 1. Soak your calloused skin in warm water. 2. Wait until your dry skin has softened. 3. Wet the pumice stone. Rub it gently over the calloused area. 4. Rinse and repeat 3-5 times according to your feer condition. 5. Dry and moisturize your skin. 1. Rinse your pumice stone thoroughly after use and hang it up to dry. When the pores of the stone get clogged, you can clean it with a small brush such as an old toothbrush. 2. Every month or so you should boil the stone in water for five minutes to deep clean it and kill any bacteria. All our INCOK products carry a lifetime warranty, and 100% satisfaction guarantee. Order your pumice stones today and try out this natural and ancient technique of skin treatment! 100% NATURAL VOLCANIC LAVA PUMICE STONES - Pumice is formed when hot lava mixes with water then hardens, resulting in a porous and abrasive stone. INCOK pumice stone is just derived from volcanic lava pumice, its colors and shapes are various for they are natural pumice, so they will drop a little slag, please don't worry. 100% natural material, do no harm to earth! NATURAL FOOT SCRUBBER - Looking for a solution for the rough skin? 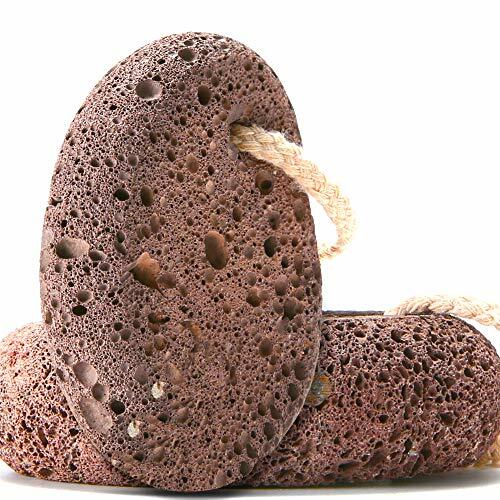 This is a natural lava pumice stone scrubber to exfoliate your feet hands and other parts of your body, making you feel renewed as you remove the outermost dead skin cells! ABSOLUTELY EASY TO USE - This foot scrubber stone is very easy to use. Soften the calloused skin in warm water, wet the stone and rub it gently in circular motions until you remove dead skin. Please do not use on wounds and sensitive areas. COMFORTABLE HANHELD SIZE - It's the perfect size and suitable for holding on palms, easy and comfortable to use. Each stone measures approximately 3.54" x 2.56" x 1", 130g. It's not too hard as a rock, but durable and portable. HANG TO DRY - Just use a little amount of soap to fully clean the stone, hang it with the strong string or rope and let it air-dry, and then it's ready for the next use! 100% satisfaction guarantee and a lifetime service guarantee. Place your order now with zero risk! If you have any questions about this product by INCOK, contact us by completing and submitting the form below. If you are looking for a specif part number, please include it with your message.